Pure Gold Bathroom Most Expensive Toilets - This bathroom was also known as the most luxurious bathroom ever. Hong Kong is home to the world’s most expensive gold toilet, it has been reported. During the Expo Global Tourist Exhibition Hall in Hong Kong plays host to the world’s most expensive gold and jewelry sparkling environmentally friendly washroom(world’s most expensive gold toilet). 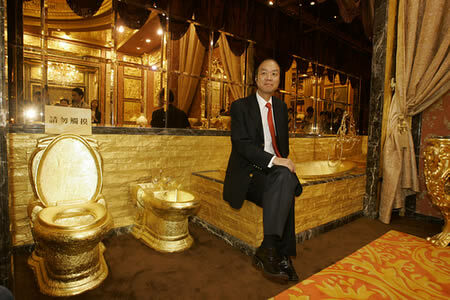 Hmm if i were him I'd rather build a golden car than this golden toilets. I'm not going to pee in this Golden toilets.. Just think of we build a luxurious bathroom and toilets just for peeing or defecate?? This Pure Gold Bathroom was Arranged by Lam Sai-Wing, Hong Kong-listed Hang Fung Gold Technology, the washroom features a solid gold toilet, gold toilet paper dispenser, gold basin, gold waste bin and air-conditioning cabinet. “The entire washroom required 380 kg of pure gold and 6,200 gemstones. In 2001, it cost HK $38 million and is now worth HK $80 million. This is truly one of the wonders of the modern world,” Stella Lai, Global Expo’s spokeswoman told the newspaper. The bathroom’s designer Lam Sai-Wing was inspired by a quotation from Lenin who dreamed of celebrating the communist revolution by building toilets of gold. I've always had a hard time calling it a "throne" but I think I could get past my tendencies on this one.